Skin Tags: $100-250 depending on size. Ask doctor for multiple skin tags. what areas are most suitable to perform Radiosurgery? Face: The technique is particularly useful for facial growths and acne spots as there is no scarring and the healing period is short. Armpits / Breasts / Neck / Groin: The technique is often used to remove skin tags under the armpits or breasts, around the V-line of neck, and in the groin. •	Removing protruding moles that get in the way of shaving. •	Reducing skin irritation that can occur when certain moles rub against clothing or jewelry. •	Achieving smoother, clearer skin. •	Enhancing appearance and improving self-esteem. Most importantly, if a mole is suspected to be pre-cancerous early on, it can often be completely removed before it causes a serious health risk. Who would best represent an ideal candidate for mole removal? Those people who can physically and emotionally benefit from having their mole removed would be considered a good candidate for the procedure. 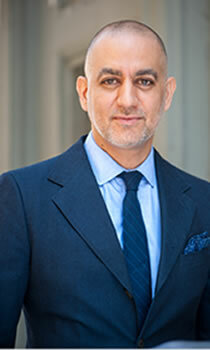 However, people must remember that there are limitations to what cosmetic surgery can do. It is meant for improvement, not perfection and is important to have realistic goals and expectations about mole removal. The lesion/mole is first prepped with isopropyl alcohol, injected with a small amount of lidocaine 2% (anesthetic), and then painlessly removed using a radio-surgery electrode*. During the procedure, the treated area is cauterized as the lesion is being removed. This means that the treated area is free of bleeding and therefore ready to be prepped with a triple antibiotic ointment and a band-aid immediately afterwards. After the procedure, patients are asked to keep the treated area clean and free of contaminents until the wound has scabbed over. This post-procedure maintenance is done by simply cleaning the wound with mild soap and water, applying the triple antibiotic ointment (supplied by us), and a band-aid 1-2 times a day for 2 to 4 days. 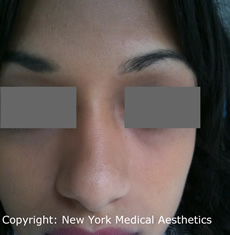 Typically patients see new skin after a week which is usually pink in color. The new skin then gradually starts to match the surrounding skin in days to weeks. If you're wondering what a skin tag is, then you probably don't have them. Those who are affected by skin tags, especially large numbers of them, are often a bit self-conscious about wearing skin-bearing clothes. Skin tags are those tiny pearl or seed-like moles that appear to hang off of the skin and look as though they could be easily removed but in fact, are quite firmly attached to the skin's surface. 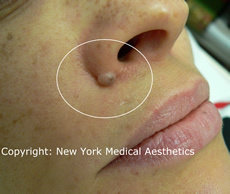 Whereas a mole is connected to the skin by its entire surface, a skin tag is attached only superficially by a tiny point at its base. As we get older, we may notice a growing abundance of skin tags, particularly on the face, neck, chest and arms. Skin Tags, also known as cutaneous skin tags, fibroepithelial polyps or acrochordons, are usually benign (non-cancerous) skin growths. These growths that are usually small are very common in people older than 30 and are thought to occur from skin rubbing against skin or clothes and shaving. These tags are generally located on the neck, armpits, trunk, body folds, and other areas. They are generally flesh colored (occasionally darker). They stick out of the skin and may have a short narrow stalk connecting to the skin surface. They are usually harmless and painless however they may be irritated from rubbing on clothing or other materials. Dr. Vafa uses the radiosurgery method to successfully remove skin tags, leaving no visible scars. The lesion/skin tag is first prepped with isopropyl alcohol, injected with a small amount of lidocaine 2% (anesthetic), and then painlessly removed using a radio-surgery electrode*. 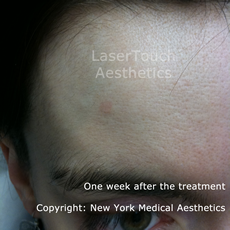 During the procedure, the treated area is cauterized as the lesion is being removed. This means that the treated area is free of bleeding and therefore ready to be prepped with a triple antibiotic ointment and a band-aidimmediately afterwards. Warts are caused by HPV (Human Papilloma Virus), which is a DNA virus. More than 100 different types of HPV have been identified. These include Common Warts, Palmar or Plantar Warts, Flat Warts, Cystic Warts, Genital Warts and many other types. HPV is spread by direct or indirect contact. Autoinoculation may also occur, causing local spread of lesions. Multiple modalities are available for the treatment of warts, but most are not uniformly effective. These include topical agents such as salicylic acid, canthardin, trichloroacetic acid, podophyllin and more. Some physicians have used cryotherapy (freezing with liquid nitrogen), lasers or prescription systemic and topical medications, which have also shown minimal effectiveness. 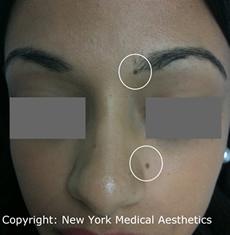 At New York Medical Aesthetics, Dr. Vafa has had very good results using the radio-surgery method for treatment and removal of many types of warts. The lesion/wart is first prepped with isopropyl alcohol, injected with a small amount of lidocaine 2% (anesthetic), and then painlessly removed using a radio-surgery electrode*. 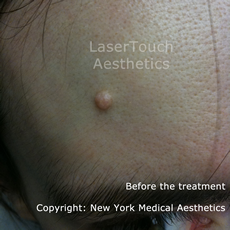 During the procedure, the treated area is cauterized as the lesion is being removed. This means that the treated area is free of bleeding and therefore ready to be prepped with a triple antibiotic ointment and a band-aid immediately afterwards. After the procedure, patients are asked to keep the treated area clean and free of contaminants until the wound has scabbed over. This post-procedure maintenance is done by simply cleaning the wound with mild soap and water, applying the triple antibiotic ointment (supplied by us), and a band-aid 1-2 times a day for 2 to 4 days. 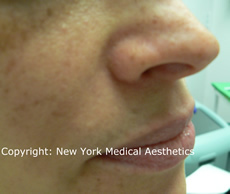 Typically patients see new skin after a week which is usually pink in color. The new skin then gradually starts to match the surrounding skin in days to weeks.